Categories: Poems, quotes and music | Tags: borderline personality disorder, BPD, therapy, world mental health day | Permalink. 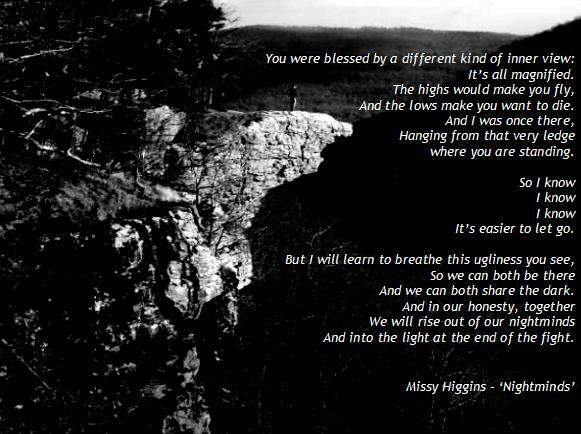 I’m not sure whether it’s ‘the done thing’ to reblog one’s own post!I wrote this for World Mental Health Day last year, but these words from the Missy Higgins song ‘Nightminds’ were in my thoughts again today, and so I really wanted to share the post again. I think these lyrics are very powerful, and what was in my mind as I was writing the post last year was not just a hope that compassion, acceptance and understanding about mental illness will continue to increase, at an ever faster pace; but a thankfulness for this online community where we share so much of ourselves with each other and try to shine a light into each others’ dark times. 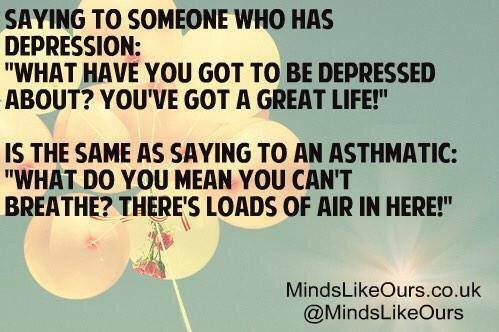 I believe that the support and acceptance we find here can make it easier for us to engage the ‘real world’ in a conversation about mental health, and to risk being seen as a ‘whole person’, mental health difficulties and all. That has certainly been my experience, and I hope it can be yours too…. In some parts of the world, 10 October – World Mental Health Day – is already over. In other parts of the world, the day is only just gathering momentum. But for as many as 450 million people around the world, it will be mental health day again tomorrow. And the next day. And the next. For those 450 million people, today’s spotlight on mental health hasn’t made their darkness any lighter. Their hope is that it’s made the depth of that darkness more visible; its character more evident; its blackness more tangible; its presence more acceptable. Categories: Poems, quotes and music | Tags: blogging community, borderline personality disorder, BPD, depression, nightminds, world mental health day | Permalink. One of the ways in which those with mental illness are frequently treated with less dignity than those with ‘more obvious’ or ‘physical’ illnesses – though I think the distinction can be misleading – is the way in which recovery is viewed. People tend to view physical illness as something outside a person’s control, to the extent that they cannot simply ‘will‘ the condition away, or spontaneously decide to get better. One tends to assume that a physical illness leads to symptoms which may make it difficult to do certain things, and it would be unreasonable to expect someone to do them (for example, to walk with a broken leg), until they had recovered sufficiently. If someone has a physical illness, unless that illness is terminal, one is naturally optimistic and hopeful of recovery. There is an expectation, even, of recovery – where this doesn’t necessarily mean a complete eradication of symptoms or of a condition, but a restored ability to live a full and meaningful life. Recovery is possible; it is to be expected; and it is probably going to take time and some sort of intervention over and above simply ‘willing it’ to happen. In contrast, people’s views of recovery from mental illness are sometimes polarized between two extremes. On the one hand, there is the view (rarely stated explicitly, but often implied by well-meaning but nevertheless ill-thought-out words or actions), that someone can ‘just decide’ to get better. That, as mental illness is ‘all in the mind’, if you try hard enough to really galvanize your thoughts, feelings, willpower and strength, all your difficulties will melt away. And on the other hand there is the view (also rarely stated explicitly anymore, but still hanging around from an earlier age), that if you have a mental illness there is something fundamentally wrong with you, and you are ‘doomed for life’, with no hope of recovery and no possibility of a fulfilling or mostly symptom-free existence. I don’t want to deny that recovery from a mental health condition may mean something slightly different to recovery from many physical illnesses. It may be difficult to define, for example, when someone has ‘recovered’: is it when they no longer meet the diagnostic criteria for a particular condition; or when they no longer need medication or therapy; or when they simply feel well enough, in themselves? It’s also true to say that even when recovered, someone with a mental health difficulty may continue to be susceptible to ‘relapses’, for example during periods of great stress or change. However, although some mental health conditions (but not as many as you might think) may be life-long in that sense, we need to careful that we don’t give the impression that a diagnosis is a life-sentence: not just for the sake of the person being diagnosed, but so that we can start to enculturate ourselves in a way of thinking which aligns our attitudes towards recovery from a mental health condition, much more with our attitudes towards recovery from a physical condition. Recovery is possible; it is to be expected; and it is probably going to take time and some sort of intervention over and above simply ‘willing it’ to happen. It is important to remember this, too: when people do not recover from a mental health condition, or take some time to recover – they are not suffering from a lack of will, or emotional weakness, or a character flaw, anymore than someone whose physical recovery is impeded by a vulnerable immune system, for example, is suffering from those things. True, some people choose not to take the help available to them, or may choose to continue in behaviours which will lead to a deterioration in their health – but this is true of some with a physical condition, just as it is of some with a mental health condition. It does not accord someone dignity, to treat them as if they are perpetuating their own misery through choice (or rather by not making a choice to get better). Neither does it accord them dignity to assume that they have no choice but to continue in that state for the rest of their lives. That is a position which robs them of one of life’s essentials – hope. When life seems very bleak, reinforcing the possibility of a life worth living is part and parcel of treating someone as being of worth, and of showing them how much they are valued. To quote from the RCN’s definition of dignity again: “When dignity is present people feel in control“. I hope that on this World Mental Health Day, we can start to think about recovery from mental illness in a way that does not make those with a mental health condition feel helpless: either because they are expected to ‘will away’ their difficulties but cannot; or because they have been made to feel that no change is possible. Instead, I hope that we can try and dignify individuals’ daily struggles with their own minds and bodies, with a response that conveys compassion, understanding, support – and every expectation of recovery and the ability to fully embrace life. Categories: Uncategorized | Tags: BPD, depression, difference between physical illness and mental illness, different views of recovery, dignity in mental health, therapy, what dignity means for recovery, world mental health day | Permalink. Though I have seen a number of images or cartoons on a similar theme (comparing ‘physical’ and mental illness), this one struck me immediately, and more forcefully than those others. I still find it incredibly powerful, and if you do too, here’s some reasons why I think that might be – do let me know if you agree! Categories: Memory Monday | Tags: borderline personality disorder, BPD, comparing physical and mental illness, depression, depression is like having no air, mental health, world mental health day | Permalink. The world is changing – but slowly. Stigma and ignorance are gradually being chipped away by greater knowledge and understanding – but will they be eradicated? Maybe not in our lifetime. And maybe not in the lifetime, gone too soon, of those 1 million people every year, who let go of the ledge from which they are hanging. The world is changing – there is a World Mental Health Day – but it won’t change in a day. It won’t change because of a day. It will change because every day, those who share our nightminds, reach out and share their darkness with each other. Those who share our nightminds see us brightly and embrace us warmly. And that embrace enables us to open up a little of our darkness to those who do not share it, and to risk being truly seen. And the more we risk being truly seen, the less alien our nightminds seem. The world will change because 450 million people can’t be wrong – though they may feel like ‘wrong people‘ to their core. If you’re not one of those 450 million people, do go out and do on World Mental Health Day -on this one, and the next. Read about mental health; learn about it; talk to someone with mental health difficulties; raise awareness; give generously, in whatever way you can. But for the other 364 days of the year – just sit with me and share the view. Let me show you what I see, in the hope that one day, I can learn to see the things that you do. Let us share the view, if not the sights. Let us see together, if not as one. Let my darkness be a revelation and let your acceptance be my light. That’s how we turn World Mental Health Day into every day. Until we no longer need a day in which to try and understand that we’re all living life on the very same ledge, but with a different vantage point. Until we realise that it’s not the colour of our souls that differentiates the darkness from the light – but just the axis on which our world is spinning. Categories: Blogging, Poems, quotes and music | Tags: 50th post, borderline personality disorder, BPD, mental health, mental health awareness, mental illness, raising awareness, stigma, world mental health day, world mental health day 2014 | Permalink.